The relative supply of homes in Tallahassee is on the rise again, and it will take a few more months to determine whether this is a seasonal event that occurs in the Spring each year, or whether something else is unfolding. As a reminder, we measure the "real" supply of homes by counting all of the homes for sale in the Tallahassee MLS, but we estimate the "relative supply of homes" by dividing the real supply by the current rate of demand. This division provides a measurement of our real estate inventory in terms of "months of supply." 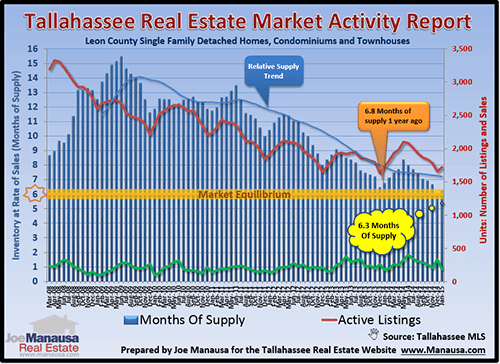 The table below shows the relative supply of homes for each major area of the Tallahassee real estate market. Additionally, each price range is shown so that we can see the difference in supply for just about any home on the fly. In order to determine the impact of the relative supply of homes on your personal situation, you have to look at the area and price range in which you live (or want to live). Overall, the housing market has risen to 9.1 months of supply (bottom right corner of the table above). By way of example, if you own a home valued between $150,000 and $200,000 in Northeast Tallahassee, there are only 5.2 months of supply of homes. This is a market at low equilibrium, meaning it is approaching a seller's market. But if you own a home valued above $500,000 in the Southeast section of Tallahassee, there are several years worth of supply, and you will have a lot of competition for many years. Understanding the relative supply of homes helps you determine your position when you negotiate the purchase or sale of a home. And if you want the absolute best real estate guidance when you sell or buy a home in Tallahassee, just drop me a note and we can schedule a time to review the relative supply of homes for your specific situation and needs. Pardon me for saying this Joe, but you have an amazing resemblance to Albert Einstein. Was he a relative? There's something in the air in Tallahassee other than our gorgeous spring weather. Perhaps the area's real estate problems have turned the corner. Ben and Melinda Soto have been our Tallahassee neighbors for nearly eight years. We wish Ben much success at Manausa and Associates.